I love this time of year when Chef Chris puts together some amazing new food specials using late summer/early autumn seasonal vegetables. During the next few months is when we get to enjoy our bounties from all our hard work in the gardens. 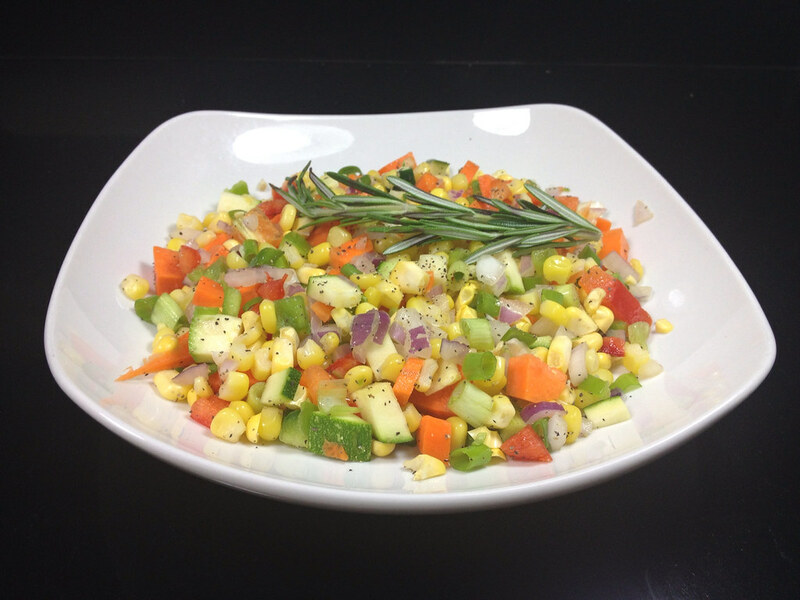 Check out our specials each week as we feature home grown items such as heirloom tomatoes, fresh Illinois Valley sweet corn or garden zucchini. Just this week alone, we have put together some interesting dishes that we hope you come in to enjoy. This unique dish doesn't grace our menu too often. 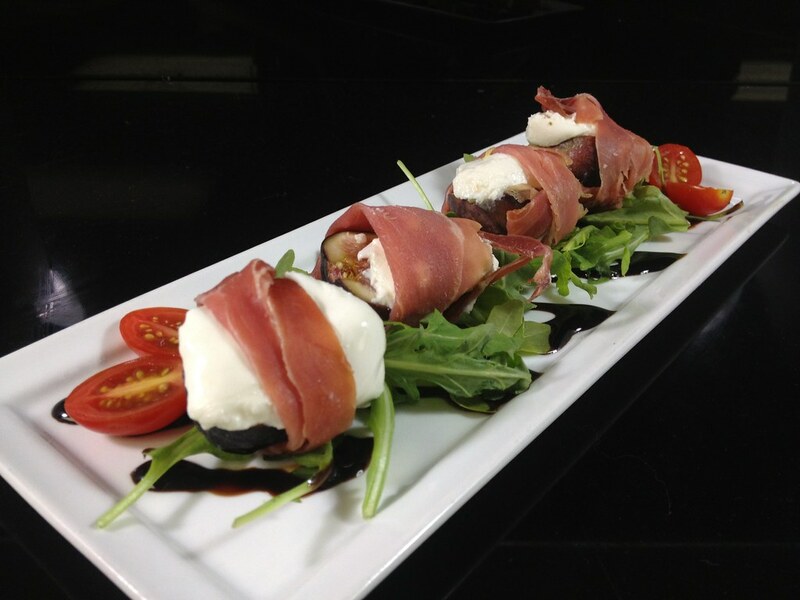 We are currently serving burrata fresh mozzarella and figs wrapped in thinly sliced Serrano prosciutto. Burrata, meaning butter, is a fresh Italian cheese made from mozzarella and cream that has a buttery taste, as its name would imply. It is typically served at room temperature with an outer shell of solid mozzarella, while the inside contains a smooth combination of mozzarella and cream. The cheese and fig combo are then wrapped in thinly sliced prosciutto, which is a slightly salty, dry-cured Italian style ham. This sweet and savory appetizer is served on a bed of fresh arugula with balsamic cream. This pasta dish brings all the flavors of your backyard garden. It features sauteed shrimp with heirloom garden tomatoes, fresh basil and mint in a garlic and white wine broth. Pappardelle is a large, very broad, flat pasta noodle. As we put together our side dishes, we size them to be shared with others alongside an entree or to be served as the entree itself for one person. Check out these interesting side dishes next time you are in. This is the time of year for sweet corn, and we have collected the freshest that the Illinois Valley has to offer. We have taken away the work and mess of eating off the cob and mixed in red and green bell peppers, red onion, garden zucchini, celery and carrots. It is then sauteed with butter, white wine and black pepper that gives you that end-of-summer perfect meal. We have turned the traditional into something spectacular. This is the first time we have used farro, and its exact definition is often debated. It has been popular for centuries in Mediterranean countries, and although we refer to farro as if it were one grain, it's actually three. There's farro piccolo (einkorn), farro medio (emmer), and farro grande (spelt). Emmer is what you'll find sold most often in the U.S. It's a harder grain than einkorn and is often confused with spelt, which is another type of grain altogether. Farro is very good for us as well. It is the lowest glycemic food out there. This cold side dish features roasted asparagus, sundried tomato, capers, fresh parsley and red peppers in a red wine vinaigrette. This dish would go great by topping it with one of our housemade black bean veggie burgers. This would be an excellent light lunch option. Click here for more on farro.